Case presentation: A 46 year-old female was referred to our lymphoma clinic for clinical assessment of multiple erythematous non-indurated plaques on her left arm (Figure 1). 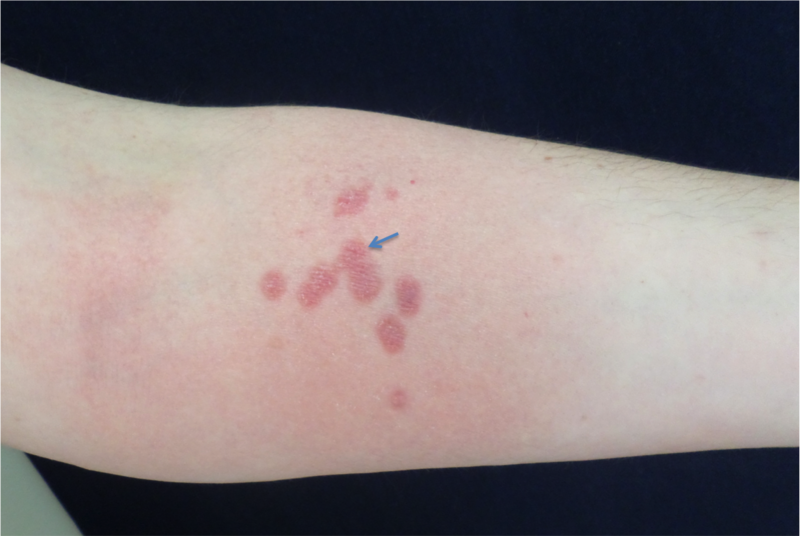 The patient reported a 3-month history of the aforementioned lesions that progressively increased, without any response to topical steroids treatment. On clinical examination, no other skin findings were noted. There was no past history of systemic diseases. Diagnostic work-up: Pathological and immunophenotypical analysis after a 4-mm punch biopsy of the lesion revealed a relatively dense lymphocytic infiltrate of the dermis with clear epidermotropism (Figure 2). In the deeper sections of the biopsy the infiltrate was characterized by multiple giant cells surrounded by atypical lymphocytes with a CD3+/CD4+/CD8- phenotype (Figures 2, 3). Based on these findings the diagnosis of granulomatous mycosis fungoides (GMF) was established. 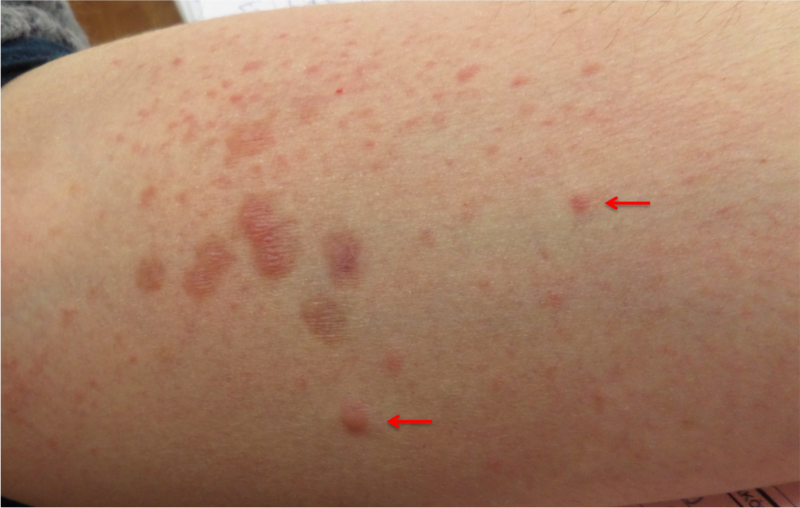 One month after initial assessment, new lesions appeared including an indurated, dermatofibroma-like lesion (Figure 4). Due to the atypical clinical presentation of the disease, a second biopsy was performed from the dermatofibroma-like lesion (red arrow, Figure 4). 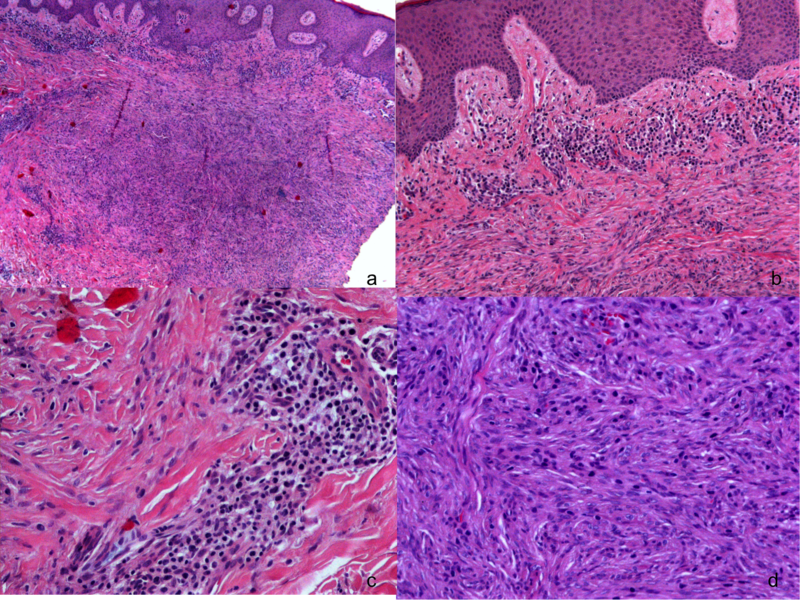 Histopathologic examination revealed the presence of a typical dermatofibroma in the mid-dermis, as well as atypical T-lymphocytes forming aggregates around the lesion, or infiltrating singly among the spindle cells of the tumor (Figure 5). Phenotypically they were similar to the neoplastic lymphocytes of the original lesion, i.e. CD3+/CD4+/CD8-(Figure 6) and during further molecular study (PCR analysis), their clonal nature was confirmed by demonstrating clonal rearrangements of the TCR gamma receptor genes. In contrast with the initial biopsy, wpidermotropism was absent to minimal. Comments. GMF is a rare variant of cutaneous lymphoma. Up to date, there are no distinctive clinical patterns for GMF and clinical presentation is most commonly indistinguishable from that of classic MF. However, a few case-reports of atypical clinical expressions of GMF have been published so far. We report herein a case of GMF with atypical clinical presentation and, to our knowledge, the first of its kind to be related to subsequent formation of dermatofibroma. Dermatofibroma, at least in a number of cases, has a close relation with prior injury, developing at the sites of previously damaged skin. In our patient it is quite probable that the initial factor triggering its formation was the destructive effect of the dermal atypical lymphocytic infiltrate upon the collagen fibers of the dermis, eliciting a granulomatous reaction. The diagnosis of lymphoproliferative diseases can be a real challenge for skin experts. The correlation of both clinical and pathological evidence is mandatory for the identification and accurate classification of these diseases. Figure 1. Erythematous small plaques on the left arm, site of initial biopsy. 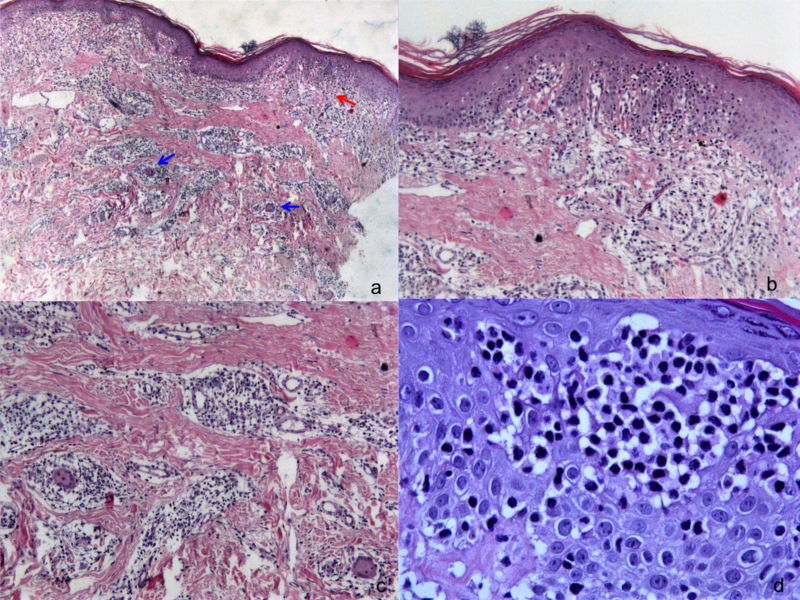 Figure 2 a-c: H&E x 40 Lymphocytic infiltrate of the dermis with epidermotropic (red arrow) and granulomatous (blue arrows) character. Figure 2d:H&E x 400 Detail of the atypical (irregular, enlarged, dark nuclei) lymphocytes infiltrating the epidermis. 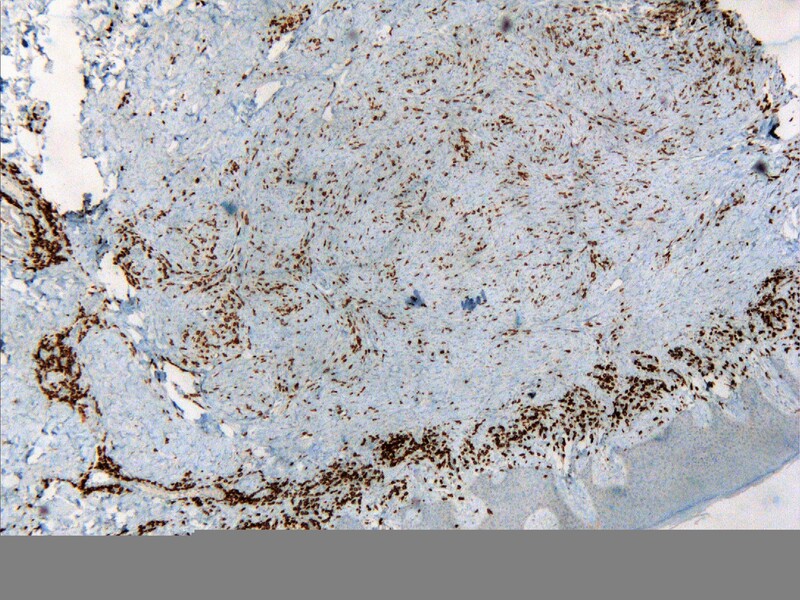 Figure 5b: H&E x 100 Atypical lymphocytes arranged in clusters outside the dermatofibroma region and beneath the epidermis with absent or minimal epidermotropism. 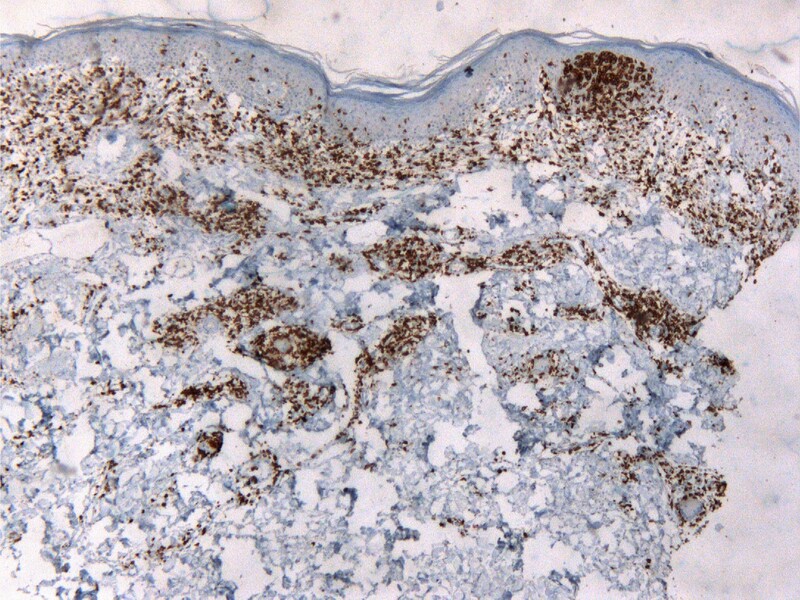 Figure 5d: H&E x 200 Close up view of the dermatofibroma revealing the presence of single atypical lymphocytes among the spindle cell component of the lesion. 2. Kogut M, Hadaschik E, Grabbe S, et al Granulomatous mycosis fungoides , a rare subtype of cutaneous T-cell lymphoma. JAAD Case Rep 2015; 1:298-302. 3. Morihara K., Katoh N., Takenaka H. Granuloatous mycosis fungoides presenting as poikiloderma. Clin Exp Dermatlol. 2008;34:718–720. 4. Gutte R., Kharkar V., Mahajan S. Granulomatous mycosis fungoides with hypohidrosis mimicking lepromatous leprosy. Indian J Dermatol Venereol Leprol. 2010;76:686–690.